HELP- What do I do with this baby bird???? Please, share your rehab story on our facebook page!! 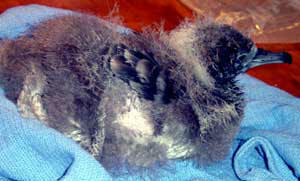 Our Sanctuary is usually unable to pick up baby birds from rescuers due to the very large size of our island. If you have found an injured raptor or seabird, call us and we, or one of our permitted volunteers, will make arrangements to pick up the bird. We have several permitted rehabbers on various parts of the Island who might be able to meet you and pick up the bird. The care instructions below should help you with initial formula choices and long term needs if you are planning on rearing a baby yourself. 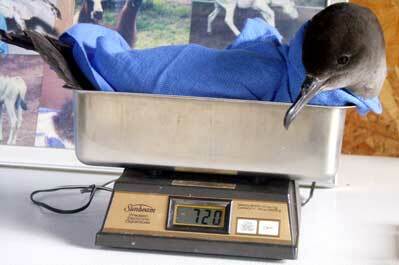 In the case of an injury, it is VERY IMPORTANT that the bird receive PROFESSIONAL CARE as soon as possible. Please, do not try treating the bird yourself. With many fractures/breaks, the longer the injury remains untreated, the more difficult it is to fix. Call us to discuss any injuries you see on the bird. When you see a baby bird on the ground is it in need of rescuing? How do you rescue/capture an injured bird? How do you keep baby birds warm? What can you feed a bird? How can you transport a bird? 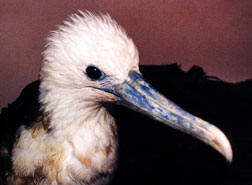 Can you or your pets contract diseases from rescuing a bird? Remember - wild birds are NOT pets. They are naturally frightened of humans. Handle them as little as possible so that they will be able to be released in the future. As few people as possible should do any care and feeding to decrease the chance of the babies becoming "humanized". It is also against the law to keep many wild birds in your home without a permit. Many people are kind enough to rear babies themselves, but this information is being made available only as basic advice. We do not advocate or encourage keeping and/or rearing wild birds without appropriate training and permits, as required. Spring is the busiest time of year at the Sanctuary and dozens of baby birds are brought to our rehabbers. We would like to remind everyone that baby birds should only be picked up if they are injured or if your are sure that they have been abandoned by their parents. Fledglings: Baby birds that are beginning to leave the nest are called 'fledglings'. Their flight feathers haven't fully developed, but they can flutter from branch to branch. Don't be alarmed if you see a fledgling on the ground. It could be taking a rest from its first flight or it could be waiting for one of its parents to feed it. A chirping baby robin on the ground, for example, is most likely telling its parents that it is hungry and it is letting them know where they can find it. Parents coach their fledglings to find suitable cover and feed them even after they are able to fly. Like all parents, adult birds can't be everywhere at once, so if you watch a grounded fledgling for a half an hour, you'll probably see one of its parents bringing it several snacks. Ground-Nesters: Don't forget that many species of birds nest on the ground. Precocial birds are birds that hatch from the egg with their eyes open, fluffy and ready to follow their mother. Sandpipers, plovers and killdeer are examples of this type of bird and if you see one on the ground and a parent is anywhere nearby, leave it alone. It is supposed to be on the ground and its chances of survival are low if it is taken away. However, if the bird's peep is weak and it can't stand, it needs attention. Touching Babies: If a baby bird is vulnerable and it appears to be in danger, then by all means, return it to its nest or to some sheltered branches. Parent birds do not abandon their young if human hands have touched them. That is a myth. Birds have a poorly developed sense of smell but strong protective instinct. Make sure you complete the 'rescue' quickly, distance yourself from it, and the mom and dad bird will find it in no time. Watch for mongoose and cats. Keep children away from the baby and nest to allow the parents to return in peace. Fixing Nests: Nests that have fallen from a tree due to wind or rain can be replaced. Put the nest in something like a small, green-plastic fruit basket (like a strawberry basket) and secure it to the tree with wire. Make sure the ends of the wire are covered with tape to protect the babies from sharp edges. If a hollowed branch containing the young of a 'cavity-nesting' bird has fallen, the broken limb can be tied to a nearby tree. If the nest is destroyed, make a new one. Cut a four-inch hole in a plastic juice container or milk jug and punch some holes in the bottom to let water drain away. Line it with a soft cloth for warmth. Replace the nest as quickly and quietly as possible so as not to alarm the parents. Once the nest is back in the tree, watch it to see if the parents return. If they don't come back after two hours, bring the babies inside for care. 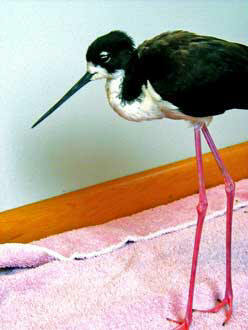 Catching an injured bird is not usually a problem since the bird is often incapable of moving and is in shock or too weak to put up any sort of resistance to handling. Pick the bird up by grasping it gently around the shoulders so that the wings are held against the body and cannot flap. At this point the bird can be placed in a cardboard box with a soft towel on the bottom and a cover on the top. If you are having trouble catching the bird, or you are afraid to touch it, a towel can be used like a "net". Simply drop the towel lightly over the bird. The darkness will both calm and immobilize the bird so that it is easier to pick up. 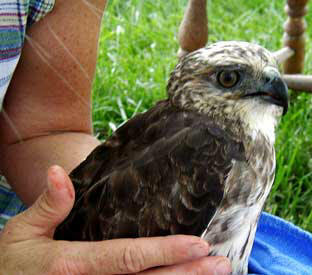 Picking up Raptors: always use extreme caution when handling birds of prey such as hawks and owls. 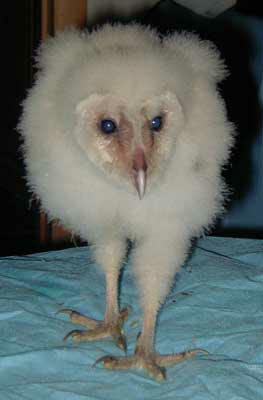 The talons and the beak are extremely sharp and strong. The bird will be most easily caught by covering it with a towel and gently picking the bundle up while restraining the feet. Do not put your hands in front or into the talons! They will clench automatically on any object, including your hands. Gently set the towel with the bird into a cardboard box. Be sure the bird is able to get out of the towel and close the top of the box. Do not try to hold the bird in your lap or hands. If a stunned raptor recovers it can, and will, lash out and could seriously injure you. If available, thick leather gloves can be worn but do not depend on them for total hand protection. If you are at all unsure of how to approach these birds call the Sanctuary for advice. We handle these birds often and can assist with pick-up or give you directions. These birds all require US Fish & Wildlife permits. Picking up Herons, Bitterns, Loons, Stilts and other long-beaked birds: as with raptors, caution should be used when approaching these birds. They have very long, spear-like beaks that are used for catching fish and these are positioned on the end of a neck that is the equivalent of a coiled spring. The beaks of these birds should be held when picking them up and a pillowcase or towel placed over the head to prevent any injury from the beak. Protect your eyes! If you are at all unsure of how to approach these birds call the Sanctuary for advice. These birds are very difficult to feed and care for. Baby birds, especially those who are featherless, need to be kept warm. Birds have a higher body temperature than humans and babies should be warm to the touch. Heat can be provided by hot water bottle. If one is not available, plastic shampoo-type bottles filled with warm water are a good substitute. These should be placed under a towel lining a carrier or cardboard box so that the bird does not get burned. Using two bottles, one on either side of the body, will provide even more warmth. This type of contact heating helps prevent pneumonia and dehydration by heating the body but not to the environment (like a heat lamp does). Finally, do not place the bird in the sun. Although birds need to be kept warm, the hot, direct sun could quickly overheat the bird, which may not be capable of moving itself into the shade. Keeping the bird outside in the sun also exposes it to predators. If you use a heating pad be sure to place it on the lowest setting and only under part of the box so the baby can move away from the heat if it needs to. Babies should be fed three to four mouthfuls of food every hour during daylight hours. Feeding can be done with a toothpick or, if the bird is larger, a smooth rounded chopstick. Each feeding should be followed with a couple of drops of water, from an eyedropper or dripped off the end of a finger. Do not hold the bird while giving food and water unless absolutely necessary, and if the bird must be held, never flip it on its back to give food. Care should be taken in giving food and water since too much of either could easily choke or suffocate the bird. Also, do not squirt water directly down the bird's throat. Just drop a little bit on the end of the beak and let it move down by capillary action. Finally, be careful not to get water in the bird's nostrils. Begin feeding young birds with an eyedropper. Fill the dropper so there are no air bubbles. If the bird won't open its mouth when food is presented, gently open the beak by slipping a fingernail between the upper and lower jaws and prying them apart. Put the dropper in the back of the bird's throat, behind the tongue, and slowly squeeze the dropper. Be careful not to get fluid in the breathing tube in the floor of the mouth just behind the tongue. Clean "extra" food from the beak and feathers with a moist tissue. Later, the bird will take thicker food and will eventually open the beak when it sees food or it may even squawk when it wants food. Stick the food to the end of a pointed popsicle stick or a drinking straw cut on a slant and give it to the bird. Do not use metal tweezers--they may damage the bird's tender mouth. As the bird grows it will eat more at each feeding, but less frequently. Very small babies will need to be stimulated to void by having you very gently wipe their bottom with a warm damp tissue after each feeding. Be sure the bird is making stool and that is it cleaned off the birds bottom several times a day. DO NOT GIVE MILK OR BREAD to birds. They are not mammals and therefore milk is not part of their natural diet. Milk may also cause diarrhea, leading to dehydration, and bread does not provide the protein and vitamins needed by small babies. When a bird is first found, it likely is hungry and dehydrated. You may make a quick food that will keep the bird alive until you can prepare a complete diet. The following recipes are for emergency use only and should not be used for more than a few hours, since they are only "energy" foods, not "growing" foods. 2 egg yolks and 2 oz. boiled and cooled Pedia-lyte, Gatorade or Coca-Cola or other caffeine-free, non-diet soda. Feed the mixture with an eyedropper. Fill the dropper, poke it down the bird's throat (past the entrance to the air pipe or trachea), and pump it in. Take care to keep the food from soiling the bird's feathers. Once it dries, it will be very difficult to remove without harming the bird. * live insects such as flies and mealworms. * corn or oatmeal that has been powdered down in a blender. Harrison's Juvenile Bird Feeding Formula (available from some veterinarians) or Kaytee EXACT "Formulas for Baby Birds", including mynas. Watch for iron rich foods with mynas since this is toxic to them. When MEAT is asked for in the diet, you can pick any MEAT from the MEAT group. You can then add, in the right proportions, any GRAIN from the GRAIN group. For example, a seed-eater diet could be 1 part P/D dog food and 5 parts wheat germ. It is suggested that you vary this diet as much as possible as long as you stay within the proper framework. For example the next time you mix up a batch of formula for your seed-eating bird, you might use 1 part boiled chicken and 5 parts high-protein baby cereal. Variety is the spice of life and also keeps young birds healthy. Top all diets with a good multivitamin supplement from your local pet store or veterinarian. You should also add a light dusting of Reptocal powder for easily absorbed calcium to help build strong bones. Cardinals:grapes, blueberries and other berries cut into small pieces, papaya bits dressed with budgie seed. Kaytee EXACT and papaya works great. Ducks/Geese: whole corn, lettuce, duck starter (with water added for ducklings). Duck starter can be purchased at feed stores or pet food stores. Do not place ducklings in water as they chill easily and die quickly. Ducks and geese in Hawaii are often hybrids of our native species, but occasionally we have had a true endangered kaloa or nene brought in. Please contact us if you find one of these birds so that we may identify it. 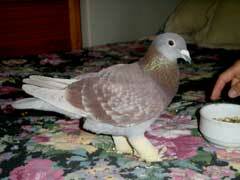 Pigeons and Doves: Adult- (normal diet seeds, grains, fruits). Babies: Feed 1/3 chick starter (available at feed stores), 1/3 GRAIN, 1/3 wild bird seed (pet stores). Mix with water to make slushy gruel. If mix is put into crop dry, add water ever so often. Feel the crop to make sure it always feels slushy, otherwise, if too dry, it will bind up and kill the bird. Only fill the crop about 1/2 full at a time. You should be able to see the crop bulge but not look like it will explode-see the photo of the cardinal at the bottom of the page for a full crop example. Chukar, Quail, Pheasants (seed-eaters). These birds feed independently. Give small bird seed, grit (coarse sand), and water. You may need to tap the seed and grit with a finger to create a bird like movement for the baby to follow until it begins to eat the unfamiliar food. Scatter the food on the floor of the box. Hawk, Owl, Falcon (normal diet is rodents, birds, insects, other small mammals). All require Federal permits to care for. Please call us if you find one of these babies immediately. At first week of bird's age, feed them pink, hairless rat babies (approx. one week old). Don't use rat heads or stomachs (white and full of milk). Chop up rest of carcass to bite size, about match-head size, and feed everything to the bird. At 2nd and 3rd week of bird's age, you can use older rats (2-3 weeks old), but no heads or stomachs and skin them. Feed everything including bones. After 4th week of bird's age, it can have whole bodies of mice and some of the fur. When the bird is eating solid food on its own, it will need water, more then in the formula or the drop you give after the formula feeding. You can drop a little water on its beak or into its mouth until it catches on or you teach it to drink by gently dipping its beak into water, then releasing it immediately. Keep a small dish of water in the box. A large dish will create a hazard for the bird and likely cause a mess in the box. The bird will learn to feed on its own. Fruit and seed-eaters will learn to feed themselves if you place a soft piece of fruit (apple or banana) on a flat surface in front of the bird and gently press the bird's beak into the fruit. Bits of fruit will stick to the beak and the bird will eat them. Repeat this procedure at each feeding until the bird feeds by itself. You may put small bird seeds in for seed-eaters to practice on. Insect-eaters can be given mealworms or other small crawling insects in a similar manner. Usually, the bird quickly learns to pick up any crawling animal. If the bird is reluctant to feed on its own, wait a day or so and try again. Feeding is a matter of maturity; the instinctive behavior will not begin until the bird is old enough. Down-covered young birds should be kept in a cardboard box indoors, away from pets and small children and out of direct sun or drafts. Keep the temperature in the box between 80ºand 90º F. A lamp with a 40 or 60 watt bulb should provide enough heat, but don't put the lamp directly over the bird. Be sure that the bird is able to move away and out of the heated area of the box. The lamp won't be necessary if the bird is fully feathered. Cover the box to cut down on disturbance to the bird, eliminate drafts, and prevent the bird from getting out of the box. Put an artificial nest made of a cottage cheese or similar container lined with paper towels in the box. This will support the bird. When the bird begins to get out of this "nest", provide a perch or two for it to rest on. Do not use a wire cage-- birds often become excited and damage their feathers on wire so that they won't be able to fly properly later. You don't have to teach the bird to fly. When it is old enough, it will fly instinctively. You may move the bird to a larger box to give it more room. Put several sticks or dowels through the box for perches. Young birds may begin to fly a week or two before they can feed themselves, so don't rush them. Don't let the bird fly freely in the house! It is likely to get trapped or injured by furniture, windows or cats. Once the bird is feeding itself on its natural diet, you should release it in a familiar area where it can be protected from cats and dogs until it can fend for itself. An outside aviary is ideal for this purpose. Provide natural food and, after a week, leave the door open during the day and close it at night for protection. It may take several weeks for the bird to adjust to the outdoors and stop returning to the cage for food. Give the bird time and continue to provide food. Don't handle or talk to the bird during this time; you should be breaking the ties between you and the bird. To carry and house the bird during the trip to the Sanctuary or to another rehabber, use a cardboard box lined with a soft towel. Cardboard causes less feather damage than a wire cage when transporting an excited bird that might be jumping around inside the container. Always put a towel in the box so the bird has something for footing as you drive. Do not use shredded paper or cotton to line the box, as these can easily get caught in the bird's toes or get wrapped around its neck. Do not use green grass cuttings either, as the dampness could give the bird a chill. Finally, do not use old birds' nests. They may harbor mites or other vermin harmful to the bird. For younger or injured birds, a towel or facial tissue can be bunched around the bird to provide support and prevent it from resting in an uncomfortable, splayed position. Once the bird is tucked safely in its box, a lid with holes punched in it or a paper towel can be placed over the box to prevent the bird from jumping out and to also give it some privacy. The darkness also calms the frightened bird. The chances of you catching anything from a wild bird are very remote. Over 2,500 birds have passed through the Sanctuary or our sub-permitees care, most of them sick or injured and no staff member or volunteer has caught anything from them. Birds can make each other ill, so do not keep a baby or possibly sick bird near your pet parrot or canary. Wash your hands well with hot water and soap before going near your own pet birds. Birds have a higher body temperature than humans and, as a result, humans do not act as hosts to bird parasites which demand warmer temperatures for survival. Mites are species specific. They may crawl on you, but you are not their host species. If bird mites do get on you, simply wash your hands with soap and water and the mites will wash away. Mites from mynas and doves are very small and do crawl quickly in an upwards path. Wash well, immediately after picking up one of these birds. Most of Hawaii's ground-dwelling birds will have parasites on them. If the feathers are quite chewed, it is one sign that it is in really poor shape and in need of help even more than its injury might indicate. Seabirds have other parasites that may startle you but are not harmful to you. If these birds are found unable to fly, then they are in great need of assistance. If you are afraid of touching the bird, get a friend or neighbor to pick it up or pick it up using a towel or gloves. All birds shown in the photos above have been cared for at the Sanctuary. Permission is freely given to copy any of the information posted here for private use. The Three Ring Ranch was fully permitted with the USF&W Service to care for all of the species shown, including migratory and endangered species. We always welcome volunteers and are willing to train new rehabbers.